How SAP is driving innovation through Social Entrepreneurship? As part of SAP India CSR’s ongoing effort to nurture talent and create more job opportunities, we got together with Centre for Innovation Incubation and Entrepreneurship (CIIE) to guide budding startups to transform their dreams into goals and significant milestones. The recent 5-day long faculty-led boot-camp at IIM Ahmedabad was one of such initiative. Often what makes a difference between an idea taking off and falling off the ridge is guidance. This is precisely where ‘SAP – CIIE Social Entrepreneurship Programme’ comes in. It is all about building their capacities through mentoring, knowledge sessions, and network connections to help them bolster their business proposition and execute them well towards achievement of their milestones. The various modules of this programme help handhold budding entrepreneurs and take their early-stage startups from prototype (ideation) stage to the launch stage. This boot camp is a part of broader Social Startup Accelerator initiative between SAP and CIIE. With the vision to provide young social entrepreneurs with professional training, we are partnering with CIIE – the technology business incubator at IIM Ahmedabad to set up SAP-CIIE Startup Accelerator Programme. The idea was to provide infrastructure and training to talents from small towns — Tier- II and Tier III cities – where such support mechanism is missing. According to a NASSCOM study, around 20% of startups hail from tier II & III cities, 93% of investments pour into the 3 major metros – Delhi, Mumbai and Bangalore – in India. In an effort to remove this disparity and encourage talents, SAP chose 40 early-stage startups from Gujarat and Rajasthan from varied domains such as agriculture, waste management, Internet of Things, arts & crafts, Artificial Intelligence, among others. 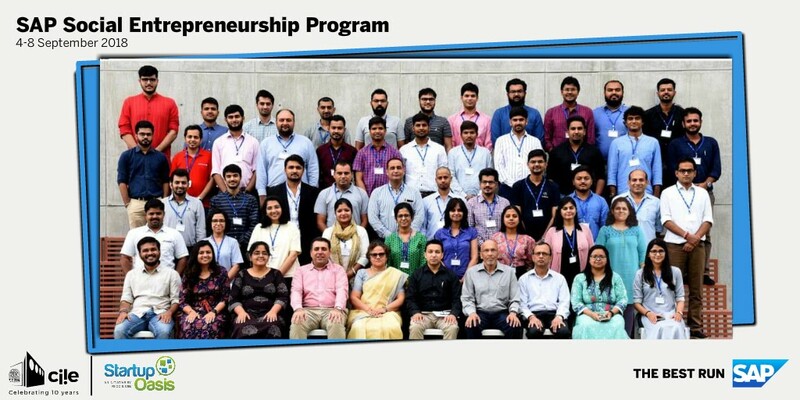 The programme was led by IIMA faculties and other domain experts, aiming to build the capacity of the entrepreneurs in running their startups better. The sessions focused on the disciplines of business modelling, design thinking, negotiations, financial and legal aspects, managing performance, scaling up, among others. The cohort spent over 25 hours of classroom sessions and 10 hours of pitch practice to understand the intricacies of product market fit, financial statements, negotiation skills, crowdsourcing solutions and customer perceptions. The key idea was to take the participating startups from launch board and pre-accelerator stages to beta stage and supporting them in their journey by means of access to resources, knowledge and most importantly pitching for funds. This Social Entrepreneurship Programme stressed on disruptive tech innovations from emerging sectors like Agritech, healthcare, energy and digital technologies which will impact lives. The programme goes as far as investing in projects which have a viable potential. The companies at the programme, though at early stage, have built market linkages and got recognition from other ecosystem players. For example, Psioasis Biogen has received purchase order of high amount and thus, receiving the market validation for their product. Co-founders of Floatbot have got selected in YES SCALE Accelerator, and Venture Launchpad at NYU, Abu Dhabi. According to the latest census report, India is set to become the youngest nation by 2020. Bridging the gap between employable youth and employment is going to be a huge challenge. The government’s attempt to create jobs in various sectors is an ongoing effort. The ‘Startup India’ initiative is a great move towards that effort. It is very important that the private sector also participates in the process for the initiative to bear fruit. Encouraging youths to start something of their own and giving them the requisite training to make it successful is a significant step in that direction. ‘SAP Social Entrepreneurship Programme’ is our way of pledging to the nation that we will partake in its growth and progress. This platform is very effective for a startup as it provides training of various aspects of business along with how and where to pitch for funding. We endeavour to invest our time, energy and capital to make this great nation regain its original glory – and it’s a firm and unshakeable promise!